Sarah Billian began writing in 2004 as a staff writer for her high school and later wrote for her college paper, the "Sophian." She writes regularly on the subjects of nutrition and health on various websites and on her food, nutrition and health blog, Grub First. Billian will receive her Bachelor of Arts in psychology from Smith College. While tuna and sardines may dominate the canned fish offerings at your local supermarket, there's more to the food group than you think -- canned salmon, for example. Like other varieties of canned fish, canned salmon is a convenient protein source that you can make into a salmon salad for a sandwich topping or for eating as is. Canned salmon contains essential nutrients such as protein and healthy monounsaturated fats. One quarter cup of canned salmon contains 90 calories and 270 milligrams of sodium. A fourth-cup serving also has 40 milligrams of dietary cholesterol. Canned salmon does not have any carbohydrates, dietary fiber or sugar. 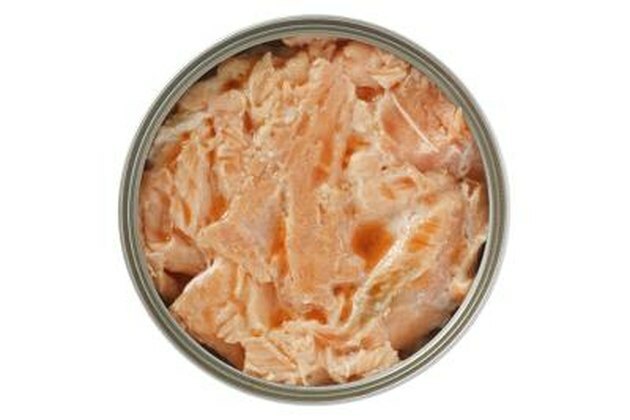 One quarter cup of canned salmon contains 5 grams of total fat, only 1 gram of which is saturated. It is not the total amount of fat in your diet that is linked with weight or disease, but rather the type of fat you include in your diet, according to the Harvard School of Public Health. Specifically, the school recommends limiting trans and saturated fats, because the two have been linked with greater risks of certain diseases. Eat foods with unsaturated fats, which are associated with improved blood cholesterol profiles and stable heart rhythms. Replace saturated fat sources such as red meat with lean meats like fish. One fourth-cup serving of canned salmon provides 12 grams of protein, an essential nutrient. Protein is found in every cell of the body, and comprises a large part of the skin, muscles, glands and organs. Protein is necessary in the diet to facilitate the repair of cells and the synthesis of new cells, and is particularly essential in periods of growth and development, including childhood, adolescence and pregnancy. Protein deficiencies are rare, and 2 to 3 servings of protein-rich foods will satisfy the body's daily protein needs. Get protein from fish such as canned salmon because it is low in fat. One quarter cup of canned salmon also contributes 10 percent of the daily value of calcium. Calcium is a mineral that is vital in the body for producing and maintaining strong bones and teeth. Calcium is also necessary for the proper functioning of the heart, nerves, muscles and other bodily systems. Getting enough dietary calcium can help prevent osteoporosis, which causes weak and porous bones. Calcium also helps prevent the development of rickets, a weakening of bone often seen in children. A fourth-cup serving of canned salmon also contains 2 percent of the daily value of iron, another essential mineral. A majority of the body's iron is contained in red blood cells, which transport oxygen to cells throughout the body. Iron is also necessary in the diet for the synthesis of ATP, the body's energy supply. Iron deficiencies can lead to anemia, in which the body's cells do not receive adequate oxygen. Anemia can range in severity, and is found most often in children, and in young or pregnant women. Heme iron sources such as fish are better absorbed by the body than non-heme iron sources, which are plant-based, reports the University of Maryland Medical Center. How Often Can You Eat Canned Salmon? What Is a Serving Size of Salmon? Can I Eat Salmon While Pregnant?